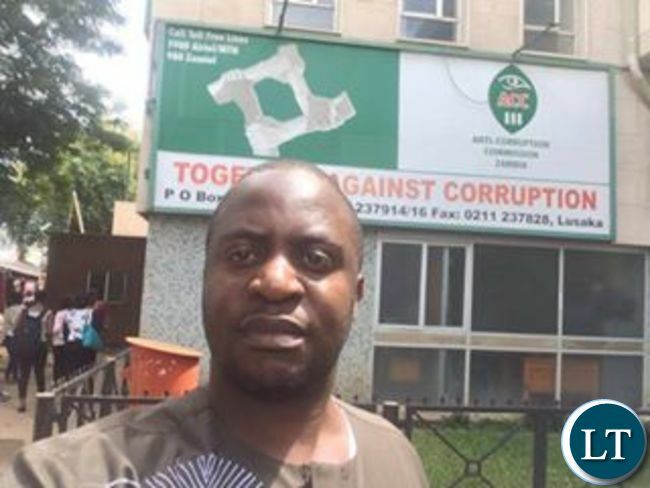 Opposition United Progressive Party leader Dr Savior Chishimba has officially reported the US$34.5 million Malawi maize export scandal to the Anti-Corruption Commission (ACC). Dr Chishimba submitted the evidence and gave a two and half hour long interview on Thursday afternoon at the ACC Headquarters in Lusaka. Dr Chishimba told Journalists that he was responding to the challenge by the PF government for him to report the matter to the ACC if he had evidence. “I have duly signed the statement which was recorded after lodging the complaint in my capacity as a tax payer and concerned leader of UPP,” Dr Chishimba said. And Dr Chishimba says the UPP legal team is reviewing the option of petitioning the Chief Justice to set up a tribunal to investigate Agriculture Minister Dora Siliya and her Commerce, Trade and Industry counterpart Margaret Mwanakatwe. He said the UPP is seriously concerned with the continuing new culture of corruption under the PF-MMD Government. Farmer alert! Beware of the biggest army worm, what ever you sweat so hard for, will find itself in Malawi or Zimbabwe. 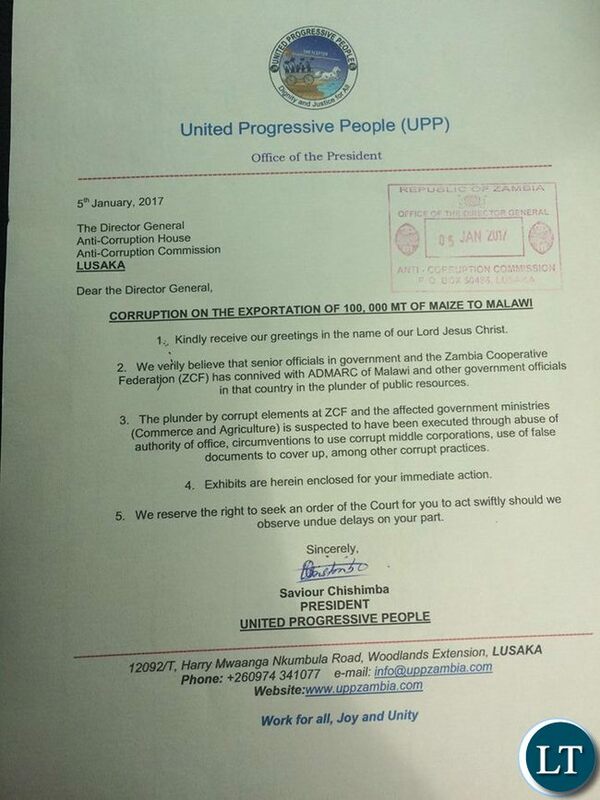 Correction: “the continuing new culture of corruption under the PF-MMD Government” – where was Chishimba when PF stole the Eurobonds without the help of MMD? PF is rotten to the core, from Willie Nsanda who died with $3m under his bed to Chimbwili who got millions of dollars of contracts without constructing anything and yet got paid for it, PF make RB & Sons’ 5% commissions look like child’s play. This is how leadership should be by not being afraid to criticize, correct and condemn when one is erring. Every Zambian knows Dora is up to no good for Zambia and how our president decided to give her a ministerial post after a scandalous MMD performance makes every one wondering. Mwanakatwe knows how to wire money and this could be the reason she is close to the president. These are a crooked duo. Thanks Dr Chishimba for the courage. We should have a media and more of the Savior Chishimba type that are supportive of such efforts to keep hammering on raised issues until they reach a conclusive end than leaving them to secretively get drowned in government red tape! That way corruption may be seen to be tackled as those involved start sweating! If true this situation is very unfortunate especially for women leaders who are proving to be untrustworthy. Women are in the forefront conducting dirty deals. Even our first mother Eve proved most dishonest and is partly responsible for our suffering in this world. Please shape up women leaders! That is why men keep suppressing you. Mukazi akakala mfwiti mu banja olo pa muzi just know that muzasila bonse kuyambila ku bana paka ku nkote. I thought MMD was the most corrupt regime … boy was i wrong! Meanwhile lets all call for prayers and go to church for this. Infact let the president call for another National Day for Corruption Prayers. Its what we are good at not so? Kudos to UPP and Dr. Chishimba. More gallant men as yourselves are needed to turn this country around and give a bit of hope to all the hopeless. That is the way to go.Talk is cheap.You win my confidence,it is the best way to tackle corruption which has become institutionalized in Zambia. Excellent work Dr Chishimba. That is the way the opposition should work – quietly gather evidence and then present it for all to see without fear or favour. No insults, name calling just facts speaking for themselves. Your profile is raising rapidly sir, continue on this path. Lets support this man, he is courageous. The post that used unearth this nonsense by digging deeper has been closed. Individual citizens now have to stand up and be counted. Kudos Mr Chishimba. I do support this man he means good for zambia , who doesn’t know savior chishimba he was in parliament worked with sata and more others like ck. We need transparence in politics generally politicians are all corrupt if not checked , that is why checks and balances are needed man is fallen therefore must always be monitored . We told you that Lungu is a disciple of Mugabe and Mu7, there you have it for your selves. Lungu’s audacity statements are based on the weak judicial system in the country. The Con courts, LAZ and the judges in the nation are weak, bought out and divided. My profound concern of Zambia’s incapability to hold any credible elections is being vindicated. We have wasted so much time, efforts and resources to improve our democracy for nothing to show up. Its a disgrace to Zambia. Saviour Chishimba is a great man, a great leader. He displays the sort of leadership that this country so desperately needs. LT, Kindly do us a favour by publishing Dr Chishimba’s profile. We need to know more about this man. The press should help build up such personalities. The issue at hand is transparency tribalism cannot not help any one Zambia belongs to all Zambians who ever comes up with decency needs to be supported. Here we need to look beyond what divides us , all we need is good governance in our country . Tribalism belongs to the past we have to move forward and see we decency in politics , I said every human being is a crook in one way or the other, we don’t have to trust any one with out monitoring, no matter who ever he/she is that is the nature all humans . No one is good except Good a lone.